Exuding a combination that is both royal and exotic, this amazing composition: Herod is truly a masterpiece. That echoes on the stunning reputation of the prestigious house that is Parfums de Marly! The Parfums de Marly fragrance collection, named after the famed French Marly castle, draws inspiration from the legacy of Louis XV and his love of breeding thorough pure blood stallions and creating perfumes. Each bottle reflects this rich heritage with an embossed crest and rich accents. 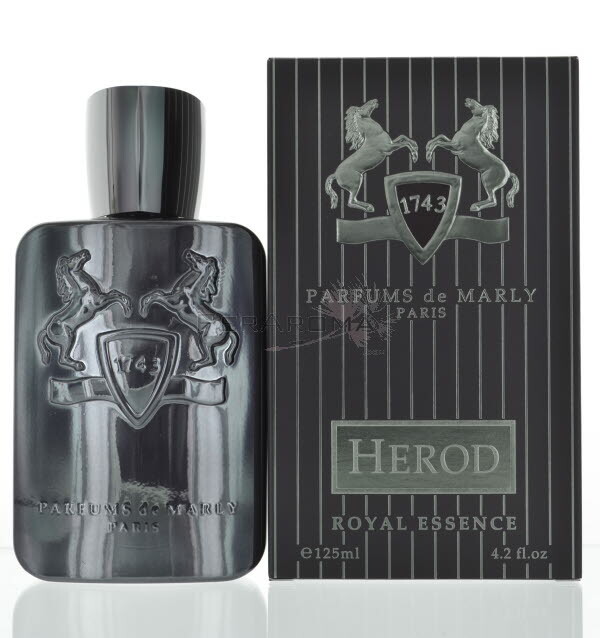 Herod is a smoky, tobacco and vanilla scent named after a famed stallion of the 18th century. – Middle: osmanthus, tobacco leaves, frankincense and ciste. – Base: vanilla pods, cedarwood, vetiver, patchouli and cypriol musk. Herod opens with a mere second of sweet cherry pipe tobacco then quickly moves into a layer of cinnamon and sugar. Then after a few minutes more. the fragrance gets drier and more woody. Still yet, a warmed rum note sits in play, but its not heavy and thick but instead it’s creamier, opulent and contained, it’s a very pleasant surprise! At around the ten minute mark, the tobacco note begins to come to life embellished by vanilla and the frankincense. It’s nice and mellow one of a kind of pipe cherry tobacco sweet scent… Herod stays in this very controlled stage, elegant and sophisticated, lovely light vanilla sweetened woody tobacco bliss that dries down to an amazing delicious and luscious fragrance that is a must for any lover of luxurious and regal scents!